In September of 2009, Telefilm Canada announced that it had selected Xavier Dolan’s J’ai tué ma mère to represent Canada in the Best Foreign Language Film category at the 2010 Academy Awards. The film had its world premiere at the 2009 Cannes International Film Festival. In January of 2010 the Toronto Film Critics Association selected Dolan to be the recipient of its first Jay Scott Prize and his debut feature was a large winner at the 2010 Jutra Awards. Les Amours imaginaires (Heartbeats) had its world premiere at the 2010 Cannes Film Festival. Laurence Anyways also had its world premiere at the 2012 Cannes Film Festival, screening in competition in the Un certain regard program. He is pictured above at the 2013 Canadian Screen Awards with one of the awards hios film Laurence Anyways picked up. It also won awards at the 2013 Jutra Awards. His 2013 film Tom à la ferme screened in competition at the prestigious Venice Film Festival. It was announced in April of 2014 that his film, Mommy, would be one of three films to screen in competition for the Palme d’Or at the Cannes Film Festival. 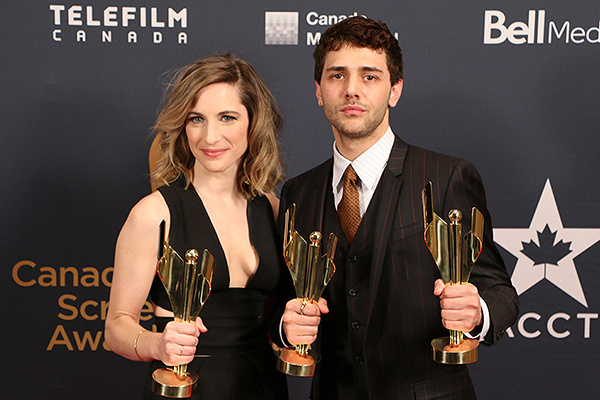 He is pictured with Producer Nancy Grant at the 2015 Canadian Screen Awards where Mommy swept the awards winning nine of the coveted trophies including Best Motion Picture and Best Director for Dolan. At the 2015 Jutra Awards, Mommy also took all of the key awards on its way to winning a total of 10. The biggest news, or so it seemed in late 2015 was that Xavier Dolan would direct the title music video for Adele’s new album, Hello. His 2016 film It’s Only the End of the World was given both the Ecumenical Jury award for its “human qualities that deal with the spiritual dimension,” as well as the highly prestigious Grand Prix at the 69th Cannes Film Festival, which is second only to the Palme d’Or. At the 2017 Canadian Screen Awards the film took six of the coveted awards including Best Picture, with Dolan picking up two for Best Achievement in Direction and Best Adapted Screenplay.